"Menacingly odd", "fabulously awkward", "terrifying" and plain "creepy" - just some of the reactions to the Christmas card sent this year by Tony and Cherie Blair, notes Ben Milne. It's set up to look like a domestic scene of an elder statesman and his devoted wife. But there's no getting around it - the former prime minister looks perturbed, even angry, according to dozens of tweeters. His teeth are bared and his eyes appear to be downright fierce, they suggest. "Perhaps the oddest thing about Tony Blair's threatening Christmas card is that this must have been the BEST photo..." tweets one observer. 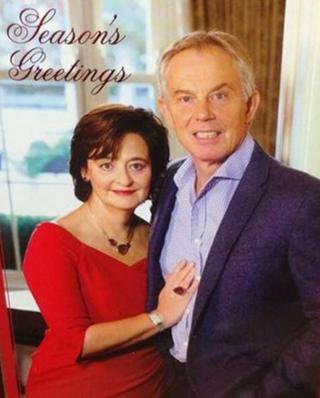 "The strange thing about Tony Blair's Christmas card is how the teeth seem to follow you round the room." "Be afraid. Be very afraid," write others. The Blairs have a difficult past when it comes to Christmas cards. While in Downing Street, they were regularly castigated for including pictures of their young children (2001), or choosing pictures in which Cherie looked good and her children looked uncomfortable (2003), or pictures which excluded their children but looked like something out of a Boden catalogue (2004). Etiquette writer Simon Fanshawe thinks that people are being unfair: "If you're trying to appeal to a whole range of people, it's a personal message from you - so you put your face on there. The choice is between that or a snowman. The man's a former PM - he's a major world figure, so putting himself on the card doesn't seem odd." In fact, self-portraits have decorated Christmas cards from the beginning of their existence. The first card was commissioned by Sir Henry Cole in 1843, and featured an illustration of himself and his family, wine-glasses in hand. In the 21st Century, it's easier than ever to produce a bespoke greeting (although the Kardashian family took this to an extreme last year, with a card of themselves which cost a reputed $250,000 to produce). Jo Bryant, an etiquette tutor with Debrett's says, "Photographic Christmas cards are usual amongst those with a significant public profile, and are a tradition of the royal family" although she adds that "enclosing general round-robin newsletters, or photographs of the family and pets, is not traditionally British and can seem excessive". Fanshawe agrees and says he objects more to "those dreadful letters from people about how well their children are doing, with messages like, 'We were so lucky to fly first class'." Other politicians play it safer than the Blairs. Nick Clegg has a preference for drawings by his children - something political commentator Kevin Maguire approves of. "What's wrong with a kids drawing of baby Jesus in a manger? You look at [the Blairs' card] and you think, 'Steady, what's going on here?' It might be hard to get it right, but it's easy to get it wrong."